Glaucoma is a group of diseases that can damage the optic nerve, causing loss of peripheral vision. Untreated glaucoma can lead to blindness. Fortunately, glaucoma is often preventable. Early detection is the key to preventing serious vision loss or blindness from glaucoma. 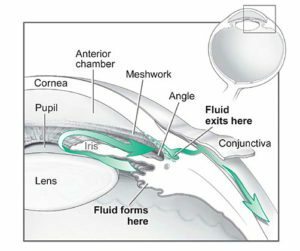 There are several forms of glaucoma including low tension, congenital, pigmenary, pseudoexfoliation and secondary glaucoma but the two most prevalent forms of glaucoma are: open angle glaucoma and angle-closure/narrow angle glaucoma. Open-angle glaucoma is the most common type of glaucoma. Gradually, damage to the optic nerve causes loss of the peripheral vision due to fluid in the eye draining too slowly, causing the pressure inside the eye to increase and cause damage to the optic nerve. High ocular pressure is a common feature of open-angle glaucoma and can be tested quickly and easily during routine eye examinations. Since this form of glaucoma is typically gradual and painless, patients will not be aware of peripheral vision loss so regular eye health exams are essential to early diagnosis. Lowering eye pressure can slow or halt visual loss and there are several options available to accomplish this, including use of pressure reducing drops and laser treatment. Angle-closure glaucoma affects less than 10% of glaucoma patients. Pain, redness and blurred vision may occur suddenly in one or both eyes. Vision can be preserved with prompt, effective treatment. The treatment for angle-closure glaucoma, or narrow-angle glaucoma, is generally initiated with a laser to open the drainage channels of the eye. At Eye Physicians of Northampton, Drs. Bleiman, Hubbe, Shatz and Shield employ state-of-the-art therapy for detecting and treating glaucoma. In addition to traditional methods of treatment, they also offer Selective Laser Trabeculoplasty (SLT), Minimally Invasive Glaucoma Surgery (MIGS), and traditional glaucoma surgeries like trabeculectomy or tubes. Visit our Glaucoma Treatments page to find out more about these options.